Microsoft surprised pretty much everyone when it brought native support for Ubuntu in Windows 10 last year. Now the company is going a step further: As promised, you can now download Ubuntu right from the Windows Store. Installing an entire OS just became as easy as downloading an app. Well, almost as easy. The feature is currently only available to users participating in the Windows Insider Program, but that’s easy enough to join if you haven’t already. You’ll also have to activate the Windows Subsystem for Linux beforehand. Keep in mind this is command line Ubuntu; it’s not meant for running graphical applications. As such it’s mainly meant for programmers and system administrators, but you can get a GUI running with a little bit of elbow grease. 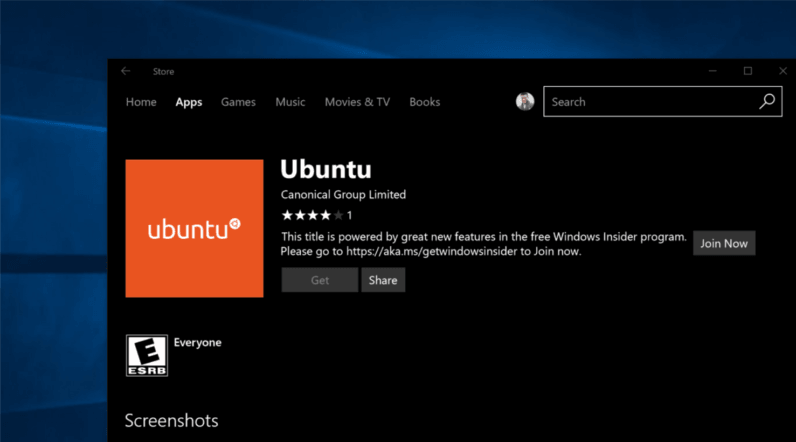 All that being said, adding Ubuntu to the Windows Store isn’t making things that much easier for the type of people who are running command-line apps. It basically saves you a second or two of typing in command prompt. Still, it’s nice to see Microsoft committing to its promise of making the Windows Store a useful marketplace, and there’s something cool about being able to download an entire OS from an app store. Just don’t expect to run Ubuntu on Windows 10 S.